As the temperature heats up and the layers come off, there’s one winter wardrobe staple that will stick around for Spring: the leather jacket. Whether you’re wearing real or faux, a good leather (or pleather) jacket is the most versatile piece in your trans-seasonal wardrobe. Our favorite styles right now are buttery soft, full of soft color and have a feminine twist with the edge of a classic moto. Styling Tips: Try wearing a black leather jacket over a bright summer dress or a soft pastel version over the classic jeans-and-tee combination. 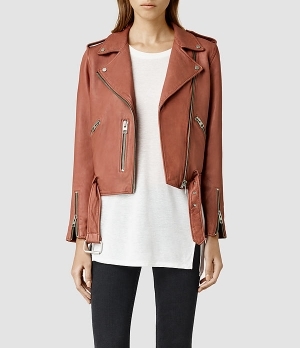 Posted on April 29, 2015 by Megan Zatko and tagged All Saints Iro Leather Jackets Vince..